Let me represent the newest Memento Publishing book called Animal Ink. 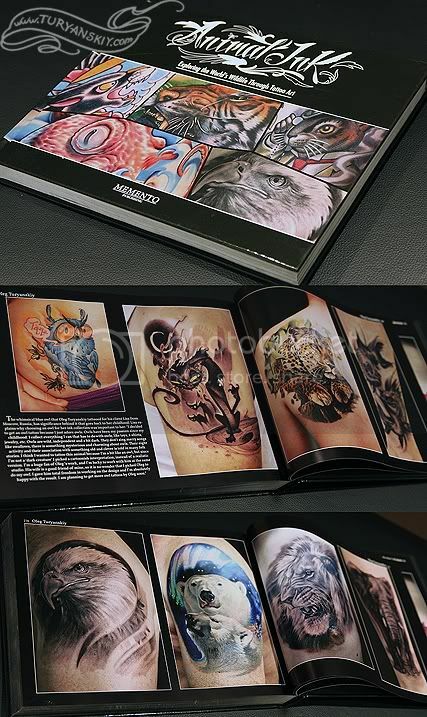 It features 304 full-color pages of beautiful animal tattoos from over 160 talented tattooists from around the world among which I have an honor to be. In addition to the photos that Animal Ink is filled to the brim with, the book also includes 62 stories about select tattoos, that detail the meanings and inspiration behind each; told from the perspective of the collectors who wear the ink and the artists who inked them. Whether your interest is that of a zoological focus, tattoo art, reference inspiration, or keeping up with the impressive accomplishments of tattooists around the globe, Animal Ink would be a wonderful addition to your library. 11 x 8.5" hardbound, coffee table style. Can be purchased from Ebay and Amazon stores.